Extradition is a process where an alleged or convicted criminal is sent to another country for the purposes of criminal prosecution or to serve their sentence. It serves the purpose of ensuring that alleged criminals will not be able to evade justice by crossing international borders. 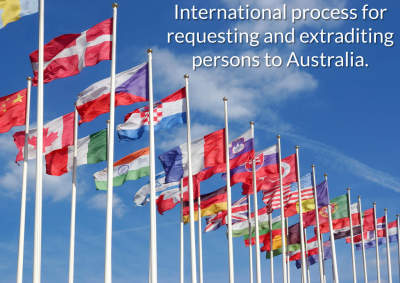 In Australia, our process for making and receiving requests is embedded in the Extradition Act 1988 (Cth). Who can make an extradition request? A request for extradition is only available to the Attorney-General or the Minister for Justice as evident in section 40 of the Extradition Act 1988. Members of the public are unable to submit a request to another nation. Which countries can Australia ask for extradition of a person? Australia can make an extradition request to those countries that are party to the same extradition treaty. Treaty partners have an obligation to consider the request made by Australia. If no such treaty exists, Australia can still submit a request but there will be no obligation that the request be considered and any decision made will have to be done in accordance with the foreign countries’ domestic laws and procedures, to determine whether the request will be answered. Extradition requests can only be received by Australia if the country is declared as being an ‘extradition country’ in the Extradition Regulations 1988. What is the process when Australia wants to make a request? The agency can make a provisional arrest request. It serves the function of requesting the foreign authorities to arrest the person where it is believed they may flee their current jurisdiction. An urgent request can be made by the Attorney-General’s Department upon receipt of an arrest warrant from the enforcement agency. Documentation is prepared between the law enforcement agency and Attorney-General’s Department to support the extradition request. A decision will be made by the Attorney-General or the Minister as to whether the request will be sent to the foreign country and such decision may undergo a judicial review. The extradition request is sent to the foreign country through the correct diplomatic channels. Both nations can then liase about the progress. The foreign country will conduct extradition proceedings in accordance to their laws and is then able to decide whether to agree to the request. If the request is granted, the Attorney-General’s Department will liase with the foreign country to arrange the surrender and the enforcement agency then escorts the person back to Australia. What about extradition requests made to Australia? A foreign country is allowed to submit an extradition request to the Attorney-General’s Department. In order for an extradition request to be granted, the Attorney-General or Minister must form the opinion that the person is an ‘extraditable person’ and the foreign country be an ‘extradition country’. An extraditable person is someone who has an arrest warrant or has been convicted in a foreign country. Extradition country is a foreign country that has been declared as such in the Extradition Act 1988. If the extradition request is granted, then a magistrate must issue an arrest warrant if satisfied that the person is an extraditable person in relation to the extradition country. This warrant can be executed by Australian police and the person will be remanded into custody. The person is able to apply for bail. Importantly, the person can waive the extradition process in which case they surrender to the foreign country and are escorted from Australia to the foreign country (skips steps 3-4). Once arrested, the person can inform the magistrate whether they consent to the extradition. The person will be committed to prison to await the Attorney-General’s determination on the surrender. Bail can be granted at this stage. The Attorney-General will decide if the person is eligible for surrender. Considerations will be given to any objections raised to the extradition, whether the person will face a risk of torture to the foreign country, whether the offence is punishable by death, whether the foreign country has given special assurance and treaty requirements. The surrender determination can be subject to judicial review. If a decision is made to surrender the person, then the person will be escorted from Australia to the foreign country by authorities from the foreign country. If the person is not removed within two months, they can apply for release.